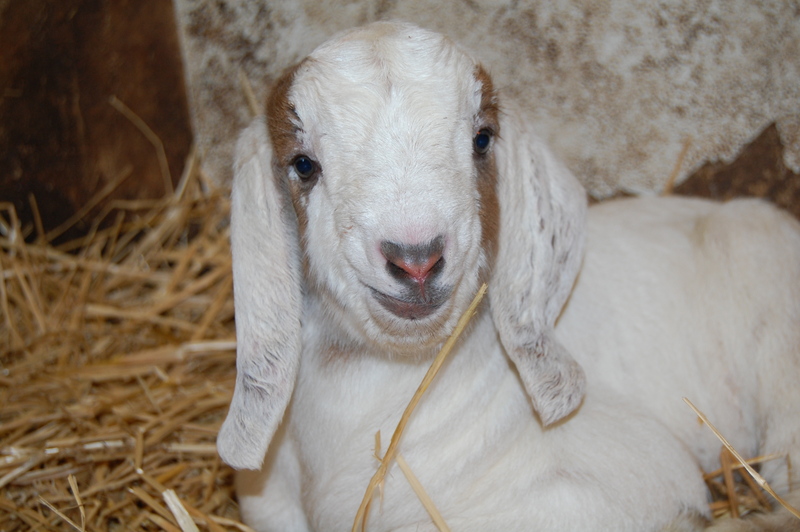 ← Sigh….NO baby goats, yet. 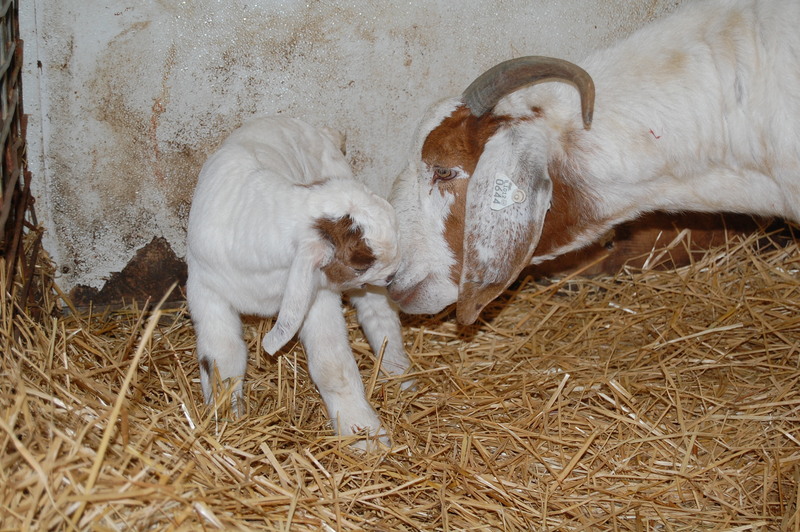 First KID is born! Short Story or Long Story? 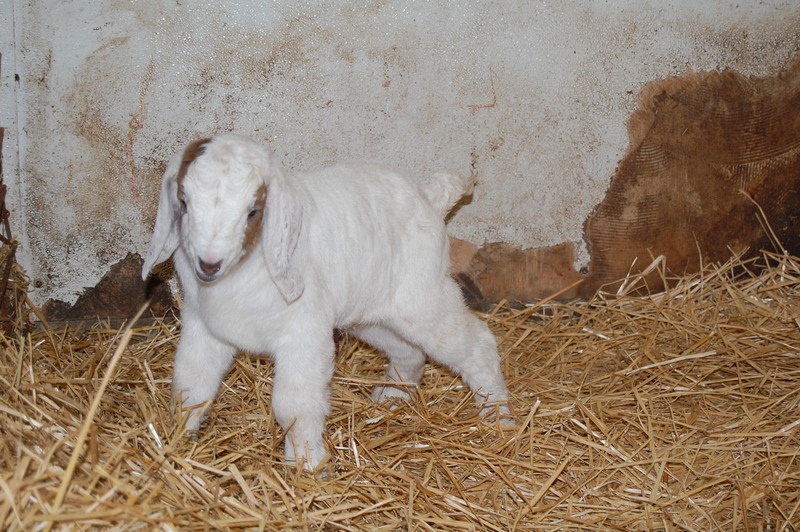 Posey had a male kid last night! We have been preparing for the kidding process for quite a while; building their kidding pens (called jugs), locating working heat lamps, etc. Then, another winter storm blew in, the temperatures dropped like a bird shot from the sky and the winds picked up in their ferocity. We decided to re-vamp the pig farrowing house into the goat kidding house and moved the girls in there on Sunday evening. We have been on high-watch ever since. I hurriedly started throwing on the winter layers and in my rush, put my boots on the wrong feet. Didn’t notice until I was jogging to the barn. I expected about-to-pop Gertie to be in labor. She was doing well. I encouraged her in a calm voice. Then, with the kid in good position, she seemed to get stuck….I could see his head, but she wasn’t having any luck making that final push to release him out into the world. I could see his little mouth working. 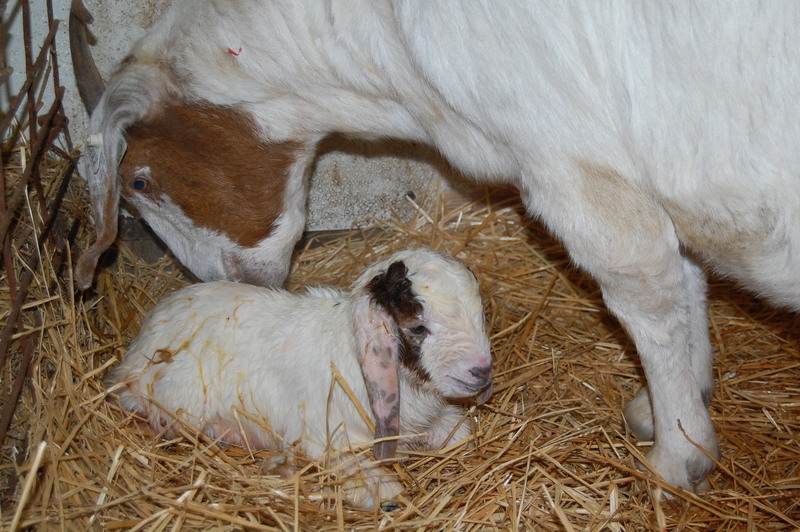 I decided to assist and had to pull, slowly, gently, downward and with a last contraction, there we had him! I cleared the membrane from around his nose and let mama take over. We kept waiting and watching. He was much bigger than I expected. He had good lungs. Posey was attentive and licking him clean, while they talked in soft bleats to each other. C’mon #2! Remember? The sonogram at the time we bought the bred girls, showed twins for both Posey and Gertie. Pig-farmer and I decided that she would have #2 quicker if we gave her some privacy. We checked back in a half hour. And then another half hour. I researched on the internet and in my books. Uhm…I think she should have had it by now. Yet, she showed no distress. 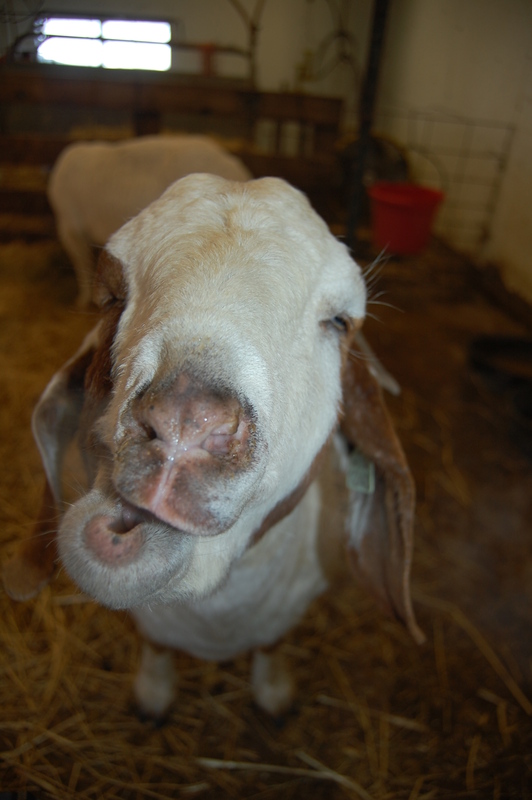 In fact, she even ate some grain and hay. No signs of continued labor at all. We left a message for the breeder we purchased from. They have been awesome to work with and answer our questions along the way. When he returned our call, we agreed that she should have had #2. He said two things were possible: #2 wasn’t in position for delivery (he didn’t say it, but I was also thinking still-birth) OR possibly, the embryo never fully developed and was absorbed by her body. He said if she passed her after-birth, she was done. He then put me on the phone with his wife, as she is their mid-wife. She told me what to feel around for, if the after-birth hadn’t passed yet. I was somewhat prepared for this from my reading. Maybe logically prepared, but not exactly ready. I told pig-farmer he was going out with me and to grab the lubricant used for pig artificial insemination. Once bundled up again, shoes on the right feet, we took stock of the situation …. and we found that she had passed the after-birth. I was so relieved. Okay, so we only have one kid instead of two; but holy hallelujah, I didn’t have to get so personally acquainted with Posey! We watched the mama and baby. Oh how freaking cute!! He had a leg that seemed weak though. I did a thorough exam and nothing seemed out of place or sore. So, I did a little physical therapy with him. Possibly he had laid a little out of whack while in utero? We decided to fire up the heater for the farrowing house. The windchill was well below zero last night. The challenge is to not make it too warm, for we will have to transition them back outside. We opted for keeping it about 36-40 degrees. It seems to be working well this way. After all babies are on the ground and full of vigor, we will shut the heat off, then, eventually transition them outside. Pig-farmer chuckled when we got back into the house. He said, “You weren’t wanting to do ‘that.’ Were you?” I sighed my relief and laughed a relieved laugh. 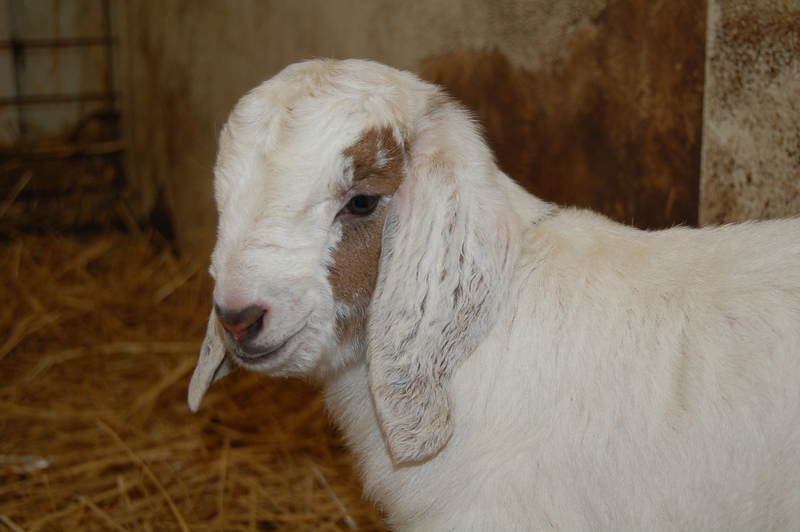 He said, “You know, you will have to sometime, if you are going to be a goat farmer?” Yes, I know … but I like to break into new areas a little at a time. Later, in bed, I tossed and turned, wondering how the baby was doing and wondering if Gertie had been inspired to deliver her babies. I tried to flop in bed a few more times, hoping pig-farmer would awaken and offer to go check on the troops. No such luck. Around midnight, I piled the layers right over my pajamas and went back out. Everyone was fine. Kid and I did another round of physical therapy. He was warm and content. So was his mother … and so was Gertie. I went back to the house and my oh-so-warm bed. Wouldn’t you know it? Pig-farmer THEN woke up. Mmmm-hmmmm. Convenient, right? Oh well – he did take the early morning shift while I drifted back to sleep for awhile this morning. This morning, everyone is still doing fine and physical therapy doesn’t seem to be necessary any longer! Note how big-boned he is in the pictures below! I think I will have to name him Dollar, so I remember his purpose. He is a market animal. We actually plan to make money at this venture, someday. I have to keep that goal in mind. We will raise our animals with great care. I’m not exactly sure how to interpret that. 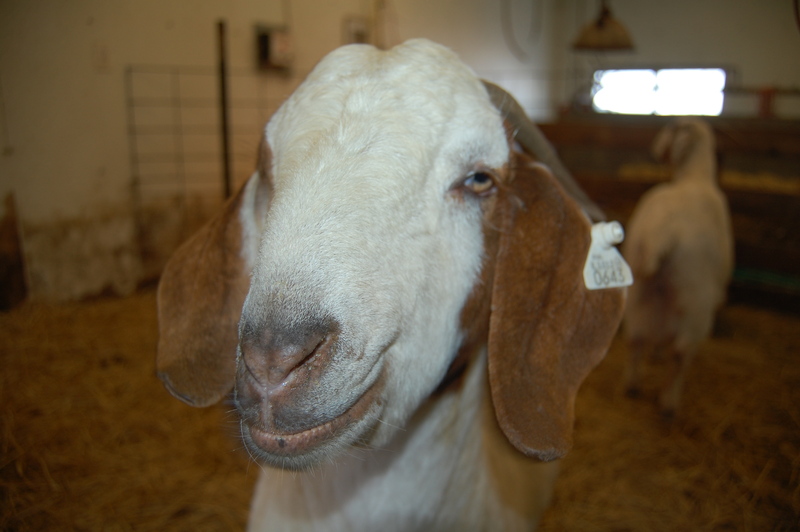 This entry was posted in Boer Goats, Country Living, Work/Career and tagged Boer Goat Kidding, Country life, farm animal photos, Pig-farmer, winter in Illinois. Bookmark the permalink. 16 Responses to First KID is born! Short Story or Long Story? Congratulations on a successful kidding! His mama lets me pick him up for snuggles, too! I love, love, love this little one!! Hip hip hooray for you and the new Mom! Doesn’t he melt your heart? So glad Mom and Baby are doing well. He is a cutie! Can’t wait to see at Gert produces! Thanks Barb! I am hoping for the best with Gertie. Baby animals at least let me hope that spring is around the corner!! Oh my goodness–what a face!!!! Congrats on the new one and good luck to Gertie!!!! I’M SO EXCITED! I chose to read the long story so I’d get all the facts but the one thing I really wanted to know was covered up by straw. Are Dollar’s hooves hardened yet? I was wondering what it felt like to Posey when Dollar kicked her. Good question! The hooves are pretty soft. That last face is priceless! Dollar is one handsome fellow! How exciting for you. I think Dollar will break my heart!